Eveline Fink & Carlota warming us up for tonight’s Berlin Berlin. Whatever comes to anyone’s mind about Berlin’s renowned nightlife, the city remains a bubbling hub of quality electronic music and hedonistic parties. 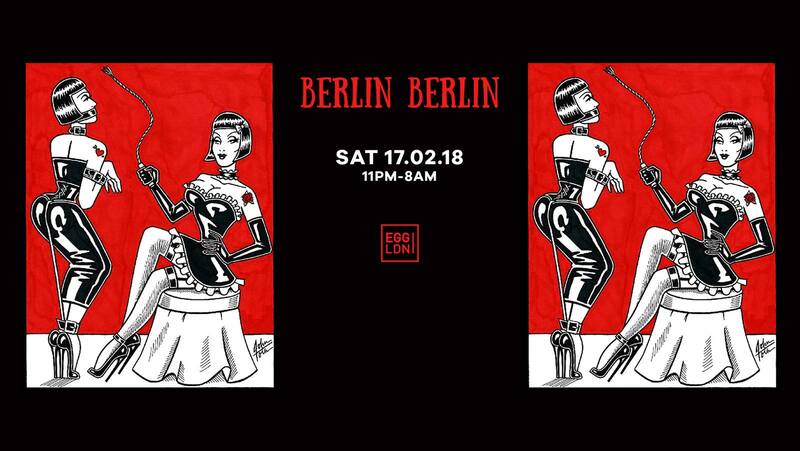 Bringing these elements to Egg LDN, Berlin Berlin returns with a robust line-up of Berlin-based talent and unabashed performers for a full immersion of Berlin club culture. Heading up another Sisyphos showcase, residents and Berlin Soul radio hosts Jonty Skruff and Fidelity Kastrow return as regular fixtures of the occasion, bringing with them a considerable collection of rumbling techno and obscure electro. With Berlin aficionados Yetti Meissner, Braunbeck, Basti Grub, Eveline Fink and Georgia Girl affirming their status’s as highly innovative producers and accomplished selectors throughout Berlin, each artist will bring their own take of the techno capital to North London. Yetti Meissner prevails as an integral part of Berlin’s electronic community playing in Watergate, Sisyphos and Ritter Butzke to name a few, while Braunbeck continues to evolve with a stream of releases on Leipzig imprint, O_RS. Enough! Music founder Eveline Fink has caught the attention of industry and dance music lovers alike with her tireless work ethic and passion, clearly reflected in her enticing sound and powerful energy behind the DJ booth. As an avid record collector and ardent adventurer, Georgia Girl brings her slick selection of deep, dubby and groove-laden melodies to the fore. East London’s unconventional Homostash return for a marathon of jackin’ house and euphoric disco, while the avant-garde Kunstkammer collective of cabaret and peep show performances complete the intense, sensory assault of Berlin Berlin. Egg LDN resident Kyle E completes the billing as long-running club resident, taking on board his own experience of playing throughout Berlin with an assortment of rich, hypnotic sounds to round off the celebrated event.